Bishop Anthony B. Taylor records his homilies at Masses celebrated across Arkansas and beyond. This archive features recordings made before March 2014 and are arranged from newest to oldest. To find these in a written format, visit Arkansas Catholic. To find his current homilies, please visit the bishop's Homily Library. Bishop Andrew J. McDonald's 40th Episcopal Anniversary, Friday, Sept. 7, 2012 (9.09 MB, MP3 format) Your browser does not support the audio element. Feast of Blessed Teresa of Calcutta, Wednesday, Sept. 5, 2012 (6.94 MB, MP3 format) Your browser does not support the audio element. Pastor Installation of Father Anil Thomas, Tuesday, Aug. 14, 2012 (6.45 MB, MP3 format) Your browser does not support the audio element. Diocesan Respect Life Conference, Saturday, Aug. 11, 2012 (6.87 MB, MP3 format) Your browser does not support the audio element. 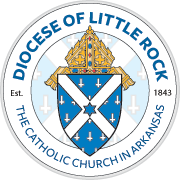 Arkansas Catholic Charismatic Conference, Sunday, Aug. 5, 2012 (14.3 MB, MP3 format) Your browser does not support the audio element. Confirmation and 16th Sunday of Ordinary Time, Year B, Sunday, July 22, 2012 (7.31 MB, MP3 format) Your browser does not support the audio element. Priestly Ordination of Deacon Andrew Hart, Saturday, July 21, 2012 (7.58 MB, MP3 format) Your browser does not support the audio element. Confirmation and 13th Sunday of Ordinary Time, Year B, Saturday, June 30, 2012 (5.67 MB, MP3 format) Your browser does not support the audio element. Fr. Mark Wood's 25th Anniversary, Saturday, June 23, 2012 (7.01 MB, MP3 format) Your browser does not support the audio element. Mass of Thanksgiving for Jubilarian Priests, Tuesday, June 19, 2012 (6.33 MB, MP3 format) Your browser does not support the audio element. Msgr. Scott Friend 25th Anniversary of Ordination, Sunday, June 17, 2012 (6.14 MB, MP3 format) Your browser does not support the audio element. 11th Sunday in Ordinary Time, Year B, Sunday, June 17, 2012 (7.83 MB, MP3 format) Your browser does not support the audio element. Most Holy Body and Blood of Christ (Corpus Christi), Year B, Sunday, June 10, 2012 (6.98 MB, MP3 format) Your browser does not support the audio element. Bishop Anthony B. Taylor commencement address, Saint Joseph Seminary College, Saint Benedict, La. "From Arkansas to Washington, from Hogs to Dawgs: How Does Local Culture Affect the Church?" Bishop Anthony B. Taylor homily, St. Mary Church, Ponca City, Okla.
Bishop Anthony B. Taylor homily, St. Monica Church, Edmond Okla.